Tina’s Terror (17m 56s, HD) This is a brand new interview with actress Ruth Collins where she breaks down guerilla filmmaking and what she brings to each role. Movie Madhouse (19m, HD) The film’s director of photography, Larry Revene, is interviewed here and talks about his craft as well as the filming of Doom Asylum. Morgues and Mayhem (17m 38s, HD) Special make-up effects creator Vincent J. Guastini talks about how he was embarrassed by the film until recently because of bad the film turned out. He also talks about how this is one of the hardest films he has ever worked on because nothing went right. Archival Interviews (10m 56s, SD, 1.33:1) This is a featurette that was made for the Code Red dvd from back in the day. It features interviews with executive producer Alexander W. Kogan Jr., director Richard Friedman, and production manager Bill Tasgal. There is no trailer or promo reel for the film, making this one of the very few blu-rays from Arrow Video to not have any type of promotional materials. I could not review the packaging as this is a check disc sent to me by Arrow Video. I can tell you that there will be commissioned artwork as well as the original release artwork. There is also a booklet with an essay about the film as well as information about the transfer. Arrow Video gives us two different aspects ratios for the film: 1.78:1 as intended and 1.33:1 as per the home video release. It is a very curious way to present the film as it was intended as a theatrical film but it ended up going straight to video. Very few times do we get both the theatrical AND home video aspect ratios for a film. Usually a label will present the film in its original aspect ratio. I can only think of a few releases that have done the two aspect ratios: On the Waterfront had three different aspect ratios and Dolemite, which kept the two aspect ratios because the home video version actually gives the film a different feel. The following 1.78:1 presentation of Doom Asylum presents the film framed approximately as intended by Director of Photography Larry Revene, who composed the shots with theatrical exhibition in mind. However, due to the original aspect ratio of the video-generated opening titles and black-and-white movie inserts being 1.33:1, these sections are presented in pillar-boxed format. Both versions of the film are taken from the same master and it is a good looking master. Colors look great and skin tones look accurate. A thin layer of grain gives way to a nice amount of detail, although not as much as you would expect. The effects work looks great and doesn’t lose its luster in the uptick to HD. Overall it is a nice transfer that keeps up with Arrow Video’s reputation of quality transfers not matter the film. The sound comes to us courtesy of an LPCM 1.0 track. The track is nice, but there are a few things that need to be addressed. -The music that the band is seen and heard singing sounds really muffled and bad. I am not sure if that is how it is supposed to sound, but it still sounds like crap. -Dialogue isn’t always clear and sometimes gets lost due to other things happening on screen. That really covers the sound. The track isn’t terrible. It is watchable and sounds great most of the time. When a group of horny teens wind up on the grounds of a creepy abandoned asylum, they think they’ve found the perfect place to party. Little do they know that inside the building’s crumbling walls lurks a freakishly deformed maniac, driven to madness by the tragic loss of his fiancée in a car accident. With an array of grisly surgical tools at his disposal, it’s only a matter of time before the youngsters begin meeting various splattery ends at the hands of the ghoulish Coroner. Before receiving the screener for the film I had never heard of Doom Asylum. When Arrow Video announced the blu-ray, I had to go and look the film up and I found out it is considered one of the worst horror films of all time. I viewed this statement as a challenge. There was no way this was one of the worst horror films of all time. Why would Arrow release it if it was? 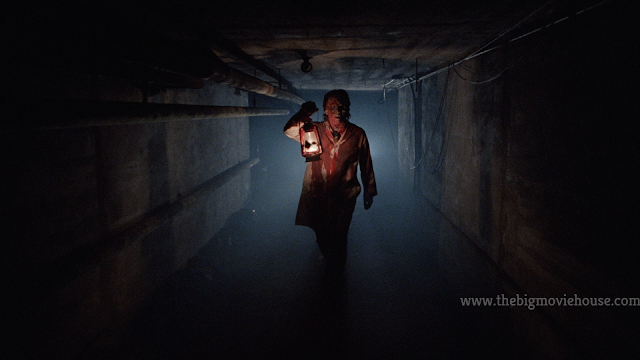 Well, I am happy to say that Doom Asylum is not the worst horror film ever made. I don't even know that I would place it as one of the worst horror films ever made. The film is bad, oh my God is it bad, but there are things to like about the film that raises it above worst status. First thing is: The film looks good. The film was shot on film, except for the opening credits, and it looks really nice. Everything is in focus and the cinematographer does a nice job adding a bit of atmosphere to the proceedings. The film also moves at a quick pace. The run time is under an hour twenty and the film never feels longer than it needs to be. The effects are pretty good as well. The killer has a lot of damage done to his face and it always looks good. 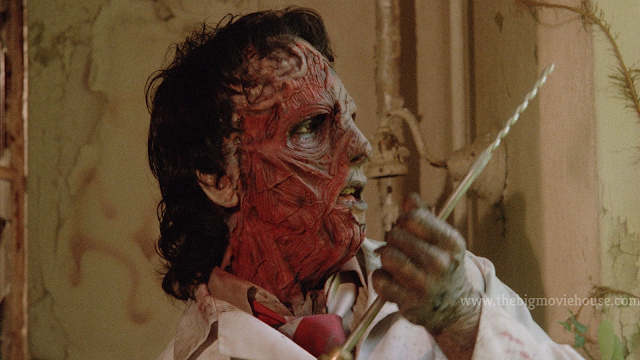 It isn't disgusting or anything like but it did kind of remind me of Darkman. The film is a slasher film and kills in those films are expected to be outstanding and they are for the most part here. The standout kill is the drill to the head while there is an acid bath that is eerily familiar to a certain death in Jason X. So the film delivers in the effects department. Now, I will make what I didn't like about the film as short as I can. The acting, for the most part, is awful. Even the killer isn't very memorable. Why do they call the killer The Coroner if he wasn't even one, but a lawyer? Everyone looks like they are having fun but I never really believed anyone. There is a tinge of either overacting or underacting (Yes I just made that word up) in each role. The big offender is the lead singer of an all girl rock group. She is just overacting like no one's business and it kind of takes you out of the film. The editing and direction aren't very good either. The film, while paced well, has scenes that are off. Something will be happening and the characters have either no reaction to it or a delayed reaction resulting in the audience yelling at the screen for the characters to do something. 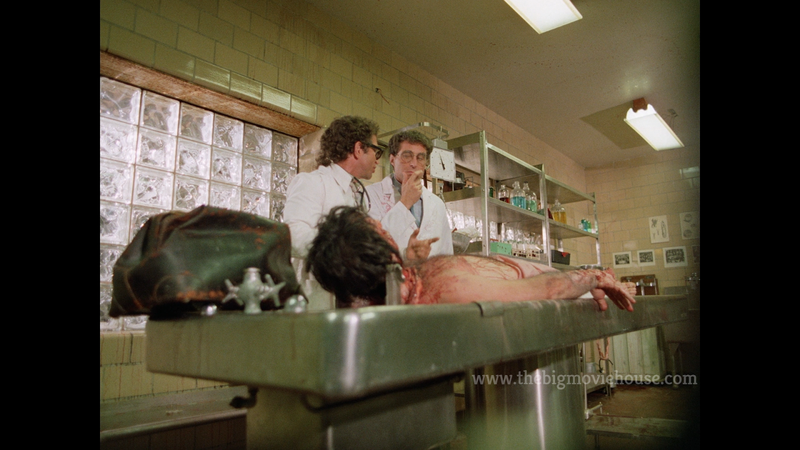 This happens early on in a scene in the morgue. One character seems the killer move, yet does nothing about it. It is just weird and should have been dealt with. The direction is very flat. 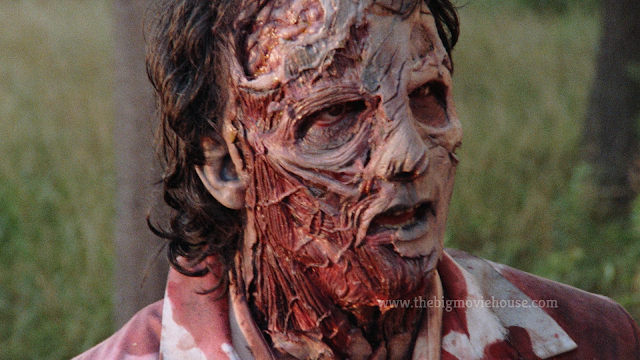 Horror films of the 80’s, especially slasher films, had at least one shot that was kind of their showstopper. There is a shot in The Burning where the killer pushes a his victim up against a tree. The starting point is a bit away from the tree and the positions of the actors and the camera make for a very interesting shot. There is also the canoe reveal in that film as well. Doom Asylum doesn’t really have any shots that stand out from the pack. Some will argue that the tunnel shot, with the killer walking towards the camera, is a unique shot. I will argue that it really isn’t. It looks nice, but we have seen that shot before in other films. In fact, there is a shot that is kind of like that in Masters of the Universe made the same year as Doom Asylum. One more thing to add about the film is its tone. 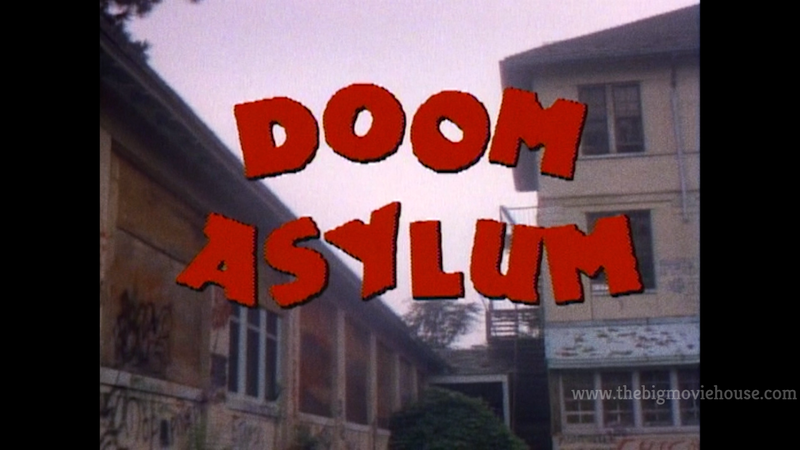 One would not be mistaken in thinking that Doom Asylum is a horror film. The title, the plot, the characters are all taken from horror films. Hell, the film is pretty gory, something that comedies usually aren’t. The filmmakers decided that they didn’t want to make a straight horror film and instead go for comedy whenever they can. The problem with this approach is two fold: First, the comedy is all over the place. One of the girls in the rock band falls for one of the guys in the other group. She fantasizes about running in an opening field, towards the guy, with her arms open as he does the same towards her. It would be ok if this happened once (actually, no it wouldn’t but go with me) but it happens twice and that is all the girl can think about. She becomes obsessed with this guy. I guess this is supposed to be funny, but it feels out of place. There are many scenes like this and it takes a certain talent to have many scenes like this and they still feel out of place. The second, fold I guess, is that almost none of the comedy is actually funny. I know that humor is subjective, but there are a lot of people out there that feel the same way. Much of the comedy consists of yelling or being goofy, but it doesn’t add anything to the film other than confusion on the part of the audience. We sit there as this schtick goes on and on and we wonder when another kill is going to happen. 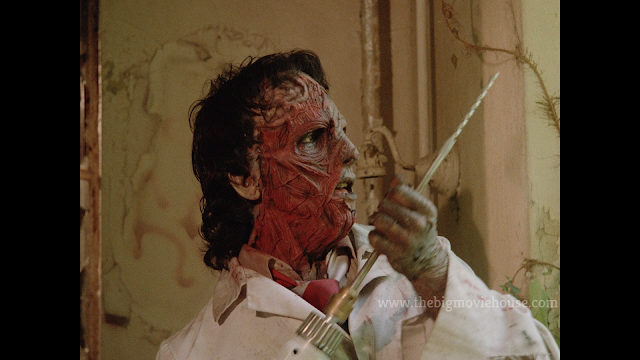 In fact, this is one of the few 80’s horror films where we actually want the characters to die as soon as possible. That is usually something that happens in horror films nowadays, not back then. 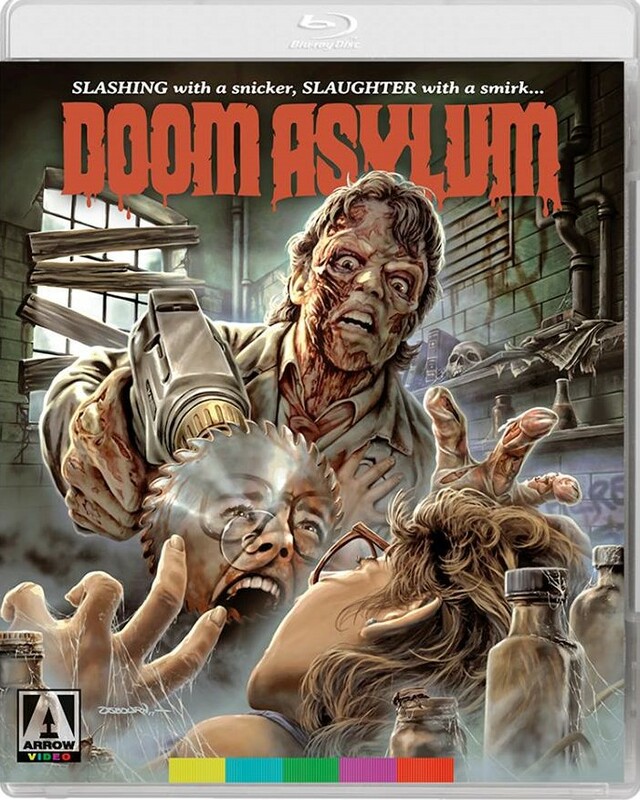 Doom Asylum is a curious mess that could have been an ok film if the filmmakers had stuck to a tone. I can really forgive much of the stuff that I had issues with if the tone had been consistent. I came to see a horror film and what I got was something that a ten year old would have found funny. While Doom Asylum is not one of the worst horror films out there, it is one of the most baffling horror films of all time. The blu-ray, from Arrow Video, is so much better than this film deserves. We are given two choices as to how to watch the film, which is something that we don’t normally get. The picture and sound quality are both great and the special features are worth checking out. The commentary from The Hysteria Continues is worth the price all on its own. Arrow Video put a lot of time and money into a film that I am not sure deserves it. Still, if you like the film or are curious about it then check it out.